Jumping back into the modern day this week with a guy who kind of has a tie-in to the past few weeks in the NHL. He made his name in the location where the NHL Draft was held this year, then he ended his career in the home of the new Stanley Cup Champions. This week, we look at the career of Manny Fernandez. The hike to the top for Fernandez began with playing Midget AAA with the Lac St-Louis Lions, while going 13-5-0 in 20 games. Fernandez would be bump up to the QMJHL in the 1991-92 season, playing with the Laval Titan and appearing in 31 games with a 14-13-2 record, then going 3-5 in nine playoff game. Fernandez would be drafted that summer by the Quebec Nordiques in the third round. The 1992-93 season would be a solid one for Fernandez, first going 26-14-2 in 42 games; then running off a 12-1 record in the playoffs-- helping the Titan to the QMJHL title and the Memorial Cup, where he'd go 2-3 in those five games. Fernandez would win QMJHL Playoff MVP for his solid record with the Titan. Fernandez had another solid season in 1993-94, going 29-14-1 in 51 games with Laval, then going 14-5 in 19 playoff games; though losing in the Finals. Even with the lose, they were the Memorial Cup host and again Fernandez would go 2-3, losing in the Final. Even with the playoffs; Fernandez was QMJHL's MVP and would be on the First Team All-Star squad. During the 1994 trade deadline, Fernandez's right were traded from the Nordiques to the Dallas Stars for Shjon Podein and a pick that would turn out to be Chris Drury. With the change of scenery; Fernandez would jump into the pro ranks in the 1994-95 season with the IHL's Kalamazoo Wings and going 21-10-9 in 41 games, while going 10-2 in 14 playoff games. Fernandez would also appear in one game for the Stars, which was a loss. The 1995-96 season had Fernandez sticking with the now rename Michigan K-Wings, playing in 47 games with 22-15-9 record, but going only 5-1 in six playoff games. Again that year, Fernandez would move up to the Stars, but for five games and a 0-1-1 record. It was a shaky 1996-97 season for Fernandez, only posting a 20-24-2 record in 48 games, then 1-3 in four playoff games. Yet, the 1997-98 season was a bounce-back year, as Fernandez would go 27-17-5 with five shutouts; then going 0-2 in the playoffs. Again, Fernandez would play in Dallas for two games with a 1-0-0 record. Fernandez would shift to the Houston Aeros of the IHL for the 1998-99 season, going 34-6-9 in 50 games before going 11-8 in 19 playoff games; helping the Aeros win the Turner Cup. Fernandez had a loss in his only appearance for the Stars. The Dallas Stars finally gave Fernandez a chance as a back-up for Ed Belfour in the 1999-2000 season, going 11-8-3 in 24 games, then having a no-decision in his only playoff appearance. Fernandez would be pushed out by the up-and-coming Marty Turco, so Dallas trade Fernandez along with Brad Lukowich to the newly formed Minnesota Wild for some draft picks. The 2000-01 season had Fernandez split time with Jamie McLennan, but Fernandez was the better of the two with a 19-17-4 record in 42 games. Fernandez would split time with Dwayne Roloson in the 2001-02 season, getting in 44 games and finishing with a 12-24-5 record. With Roloson excelling, Fernandez would be relegated to back-up for 2002-03, compiling a 19-13-2 in 35 games, then appearing in nine playoff games with a 3-4 record. Yet again for the 2003-04 season, Fernandez was the "1b" and would get in only 37 games with a 11-14-9 record at the end of it all. The lockout brought Fernandez to Lulea HF in Sweden for 19 games that year, but when the NHL returned, Fernandez would be the top goalie in Minnesota. The 2005-06 season was Fernandez's best yet finishing with a 30-18-7 record in 58 games. Even still, due to another goalie coming through the ranks (Niklas Backstrom), Fernandez had to split his time in 2006-07, finishing with a 22-16-1 record in his 44 appearances. With a solid team all around, Fernandez and Backstrom would win the William M. Jennings Trophy for fewest goals-against in the NHL. Unhappy with the playing time, Fernandez would be traded by Minnesota to the Boston Bruins for Petr Kalus. However, the first season in Boston (2007-08) was a horrific one, as he would only play in four games with a 2-2-0 record, as he would have both back and knee surgeries, as he was recovering. Fernandez bounced back in the 2008-09 season, though a back-up to Tim Thomas; playing in 28 games with a 16-8-3 record, playing enough games to win the Jennings Trophy again. After that year, without a contract, Fernandez faded into the darkness without a formal retirement. It seemed that he could never get a fair shake, with prolonged time in the minors and having to split the time with other goalies-- Fernandez never seemed to get the confidence boost to really show how he could perform. Even when he did, it seems he got undermined one way or another. Even still; there's a lot for him to remember and a lot of other trophies that came his way-- which can't be all that bad in the end. Every year around TV/Movie awards time, some talent agencies have been known to send out reminders to the voters about their clients nomination; or even locations saying to choose there town to shoot a movie. With Free Agency around the corner, I couldn't resist trying to sell some of the markets that could use a big name player. This installation-- Denver, Colorado and the Colorado Avalanche. The Avalanche have shown some promise in the past, but at the same time-- they haven't been able to consecutively string together good playoff performances. With a little veteran leadership, however, the fact remains that this is a team that has something going for them and if they get one or two more parts-- it's golden. After This Year, It's You and Another Two: That's right, while it's sure to change-- if you're going to sign in Colorado, you'd be one of three players signed beyond the 2011-12 season. Only Paul Stastny and Cameron Gaunce are the players that'll be on the roster. Sure, we'll see Matt Duchene, Ryan O'Reilly, and the rest will probably follow suit, but to know a team wants to lock you up for a decent term before the "franchise" guys-- a nice start to the tenure. Taking Breath Away: While the city there is already a fantastic looking area, it's a city that's in a higher atmosphere. Therefore, you better get your lungs ready for an off-ice conditioning. It may take some time to get accustomed to the entire climate of Colorado, but you'd have a distinct advantage over the opponents coming into it....or not, either way. Plus, if nothing else-- you won't need an flight to get into the Mile-High Club. Stop-Gap Stopper?? : With Peter Budaj on his way out, and unknown what's up with Brian Elliott, any goalie who could stop one out of 20 shots in 50+ games is golden. At the same time, the lack of defense may warrant the need for a goalie who is a proven starter if the Avs are trying to get successful and will give him the money. If they're looking for a stop-gap for the likes of Calvin Pickard coming up; then it could be an issue of getting a capable back-up to be the starter for two or three years. 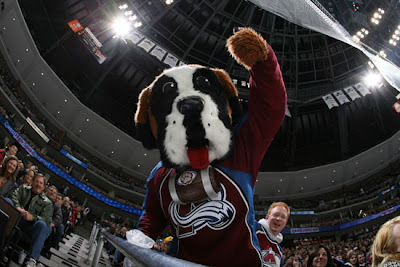 Remembering the Legacy: It's been a rough time for the Avalanche in the few years when it comes to the playoffs. Now, it seems they're bringing out those old teams and really becoming the Edmonton Oilers to an extent by remembering the past while waiting for the present to become the future past.....wait, what?? Still-- maybe that motivation could come to the young kids and they'll magically get the whole winning spirit back again. They do lack an ice girls picture, which is what really ran Craig Anderson out of town, but this is a team that has heritage on their side for it all and they do have the winning mentality with them. They'll probably have to wait in the end, but this team has a lot of promise and that's why you should sign a crazy long-term deal. Every year around TV/Movie awards time, some talent agencies have been known to send out reminders to the voters about their clients nomination; or even locations saying to choose there town to shoot a movie. With Free Agency around the corner, I couldn't resist trying to sell some of the markets that could use a big name player. This installation-- Raleigh, North Carolina and the Carolina Hurricanes. For a team that has had a Stanley Cup in their history in a post-lockout NHL, there hasn't seem to be too much buzz for the Hurricanes when it comes to the free agent market. Hopefully, this year, that'll change because of the money they have to work with and with the kind of team they can be with the talent they have. And why not, after the reasons I present to you now. Newly Discovered Hot-Bed: With the All-Star Game last year, the hockey world was exposed to the hospitality and rabid the Hurricanes fans can actually bring. Yes, it's not your usual hockey market, but at the same time-- with the right personnel, this team can flourish. Sure, you'll have some fans who are still learning the lingo and how the game goes-- but every market had to start somewhere. What's Old is New Again: For some reason, the Hurricanes love having guys on the roster who have had a tour of duty with the team before. Whether it's someone like Erik Cole or the coach Paul Maurice; if you have donned the black and red before-- make sure you know which phone number is GM's Jim Rutherford because odds are he'll be giving you a buzz in the near future to see if you want to come back to play. Under the Radar Prowess: This reason is one that depends on how you look at it, as the Raleigh area is very enamored with their college basketball, as NC State, University of North Carolina, and Duke University is all in the area. This could be a bad thing if the Canes are doing good and the fans won't come out to see them play because of the routine of getting into basketball; but it could also be good if there are struggles with the squad as the team would get lost in the fold due to the intensity of the ACC. Arena Rowdiness: With a team name like the Hurricanes, you're going to have a building that'll do all the things it can to be loud and create as much noise as possible. Whether it's from the hurricane warning horn being sounded at the beginning of the game or the fact Ric Flair pops up after every Carolina Hurricane goal......and period open.....and whenever he feels like because he's Ric Flair, dammit (WHOOOOOO!! ); the energy that can be create could be a motivator and a deciding factor from game-to-game with this team; and who doesn't like positive vibes when playing at home. The Canes have to try and act accordingly to keep up with the rest of the Southeast Division, who would are always on the look-out for the the best team there and stockpiling great talent to make sure they move onto the playoffs. If Carolina wants to "keep up with the Joneses", they'll have to be willing to spend a little and convince free agents it's a great place-- which it is. Sure, the Edmonton area has been seemingly snubbed with the past dealings of Chris Pronger, Dany Heatley, and other prominent free agents and possible traded players not liking the area for some reason or another. There's a lot to be intrigued about when it comes to Edmonton, and here's a few reasons why. Team of Hype and Hope: This is a team that has the past two 1st Overall Picks in the NHL Draft and if not for a late-season injury to Taylor Hall, they may not have been in that spot. In any case, why wouldn't someone want to play in a line-up where there's a lot of attention on the young guys and you could actually guide them to the promised land a be looked at as a savior....so long as Ryan Smyth doesn't come back, of course. New Arena Fever: Sure, when someone signs there; they'll be playing in one of the oldest buildings in the league, but there's relief. If someone signs a multi-year deal, said signee could be playing in the new home of the Oilers in their own little mini-city that owner Daryl Katz is proposing. It's like you're playing in Edmonton, but not. Plus, they'll have longevity there as the arena deal keeps the team there for 35 more years. Hockey Weather Year Round: If you need hockey weather to get yourself more into the game, you'll want Edmonton. Sure, the wind chill can get to -40 at night and sure there's more snow than Rick James ever saw during his partying years-- but it's a great atmosphere and keeps your focus on the game and on the team. You won't have the annoyances of not wanting to play because it's too nice out and there's a beach inches from your arena-- you'll be dialed in with the weather. On The Shoulders of Giants: Each and everyday you'll look up at the rafters or look around the arena and see what you've got to live up to. With the likes of Wayne Gretzky, Mark Messier, and Grant Fuhr plastered all over the place, Kevin Lowe in the front office, and a bevvy of other Oilers legends that will undoubtedly have their uniform number retired or re-retired or some kind of thing to delay the game for 10-15 minutes-- you'll have no choice but to gain that winning feeling for your team. Granted, there's a lot of work for the Oilers, as they have finished 30th for the second straight season; the fact remains there's nowhere to go but upward. With a full season with the young guns that the Oilers are sure to have, this could be a great situation for many free agents.....just so long as Steve Tambellini doesn't give a player who's over-35 a crazy, long-term deal like so much Nikolai Khabibulin. Every year around TV/Movie awards time, some talent agencies have been known to send out reminders to the voters about their clients nomination; or even locations saying to choose there town to shoot a movie. With Free Agency around the corner, I couldn't resist trying to sell some of the markets that could use a big name player. This installation-- Sunrise, Florida and the Florida Panthers. While they are the bottom of the list in salary accounted for, the team has shown some promise and very unassuming when it comes to their actual team. They're going to have fresh start with the coaching staff and should be able to meet an expectation of.....well, icing a team....but here's the reason to sign on with Sunrise's favorite (and only) team. They Have The Cash: That's right, if you want to go to a place that's going to need to fill their roster, it's the Panthers. They'll have over $40M UNDER the cap, which means about $20M UNDER the floor; which means they'll have money to burn. With 11 players signed, odds are they'll be looking to get some big names.....or at least recognizable names, including the goaltending position. It's Fan Friendly: If you sign there, you'll be showing you're one with the people. The team is already making waves in the community, asking the fans how they'd like to see in the line-up. Sure, that's probably a way to gauge who the fans actually want to see and who they could actually maybe get on the market, but still-- it's fun. Granted, there's tarps covering up the upper deck; but that's neither here nor there. If you act now, stuff the ballot box and maybe sway management to sign you. Not Much Pressure in the Sun Belt: While other warmer climate cities like Phoenix and Tampa have some kind of expectations.....the Panthers haven't been in the playoffs since the 1999-2000 season; so if you don't carry the team to the second-season.....that's not on you, it's the franchise history that's dooming you. But if you do make it, you're a superstar. They Are Seeing Red: No, it's not the Unwritten Law mainstream hit, nor are they trying to make a big Russian movement (that we know of); but the Panthers are going back to their roots. With the introduction of a red jersey, the Panthers harken back to the day of John Vanbiesbrouck, Pavel Bure, Scott Mellanby.....umm....Dave Lowry....errr....it really drops off from there, not going to lie. But still-- it adds to the redness that's going to be in the Southeastern Division. So, if there's nothing else to think about and you want to deal with seeing Alex Ovechkin and Eric Staal a majority of the season, then the Florida Panthers are the team for you. Sure, they have a young squad; but even if you had some success with your other team-- you'll be the big man on campus when you sign with the Panthers. Plus, it's warm in the winter....so if the team still stinks-- you can escape to the beach right outside your door. While we have finished yet another season, we turn this week's AGM to probably one of the most under-appreciated goalie to ever win a Stanley Cup. While he hailed from Glasgow, Scotland; he was one of those from the British Dominions to move to Canada and really take a liking to the Canadian game. He had a great start to his career, but it didn't last-- but when does it ever in this feature?? This week, the profile of Andy Aitkenhead. Aitkenhead moved over from Scotland with his family and settled in Saskatoon, where he would play his amateur career there. Int he 1921-22 and 1922-23 season, Aitkenhead played with the Yorkton Terriers, Saskatoon St. George, Saskatoon Quakers. He would make an appearance in the Memorial Cup play-down tournament with the Quakers in 1923. Aitkenhead would turn semi-pro locally for the 1923-24 season, playing for the Saskatoon Nationals and Saskatoon Empires, leading both to the Allan Cup tournament (Nationals in 1924 and Empires in 1926)-- but not making it to the finals. Aitkenhead would then move onto the Prairie Hockey League in the 1926-27 seasons with the Saskatoon Sheiks. 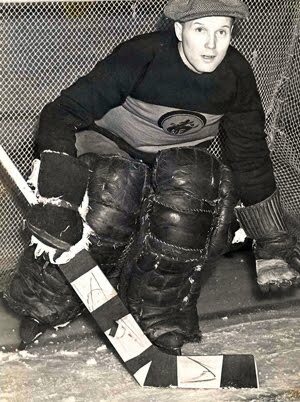 That first season, Aitkenhead would play in 32 games while going 14-15-3, with half his wins coming by way of shutout; as well as going 1-3 in the playoffs. Staying with the Sheiks for the 1927-28 season, Aitkenhead would go 18-5-5 in 28 games, with seven more shutouts to his name. However, Aitkenhead would be taken out of Saskatoon and Canada entirely, as he was picked up by the New York Rangers in the Inter-League Draft in 1928; but Aitkenhead would be playing for the Springfield Indians of the Can-Am League in the 1928-29 season. In the 40 games he played, Aitkenhead had a 13-14-13 record with six shutouts. The Rangers didn't have room for Aitkenhead, so they dealt him to the Portland Buckaroos of the Pacific Coast League for cash before the 1929-30 season. Aitkenhead had an amazing first year in Portland, going 20-10-6 in 36 games with 16 shutouts to his name. However, he only went 1-3 in four playoff games. The little slump continued in the 1930-31 seaosn in Portland, with Aitkenhead having a 12-15-8 record in 35 games, even with six shutouts. After that season was through, Aitkenhead was headed back to New York, as Portland traded him back to the Rangers for cash. The 1931-32 season had Aitkenhead playing with the Bronx Tigers of the Can-Am League, going 16-13-4 in 33 games with four shutouts, then 0-1-1 (yes, a tie) in four playoff games. Aitkenhead would finally get his chance in the big time, as he was named the starting goalie for the Rangers in the 1932-33 season and made the most of it. Aitkenhead would go 23-17-8 in 48 games with three shutouts. Then, in the playoffs-- Aitkenhead went 6-1-1 in the playoffs, with two shutouts, helping the Rangers win the Stanley Cup. The follow-up season was a bit of a struggle for Aitkenhead, going 21-19-8 in the 1933-34 season, but also recording seven shutouts. Yet, there were growing concerns about Aitkenhead's mental state; which is why the Rangers went out to get Dave Kerr-- relegating Aitkenhead to ten games in the 1934-35 season with the Rangers with a 3-7-0 record. Aitkenhead was sent to down to the Can-Am League with the Philadelphia Arrows, winning the only game that he played in. The Rangers didn't have room for Aitkenhead, so he was sent back out west, back to the Portland Buckaroos for the 1935-36 season. In that season, Aitkenhead would go 11-4-6 with five shutouts, but then 1-2 in the playoffs. While Aitkenhead got more games (40), he didn't fare too well in the season, only going 18-14-8, while going 1-2 in the playoffs again. Yet, it was a great bounce back year in the 1936-37 season, having Aitkenhead going 22-13-5 with seven shutouts; then going 3-0 in the playoffs, helping Portland win the Pacific Coast League title. That same year, Aitkenhead also played in a game with the Spokane Clippers as a fill-in and won that game as well. The 1937-38 season had Aitkenhead still with the Buckaroos, yet would finish the 16-18-8 record in 42 games, then going 1-1 in the playoffs. However, like seems to happen, Aitkenhead bounced back in the 1938-39 season, with a remarkable 31-9-8 record with nine shutouts and then going 4-1 in the playoffs, helping Portland to yet another PCHL championship. In another odd moment, Aitkenhead filled in for a game with the Seattle Seahawks of the PCHL, but didn't get a decision. As seems to the be norm, Aitkenhead slumped in the post-championship season of 1939-40, going 17-18-5 in 40 games, then 1-4 in the playoffs. Aitkenhead would get on more game in for Portland in the 1940-41 season, which was a win. Aitkenhead would hang-up the pads after that. While not many knew what happened after his playing career and before his death in 1968, the Glasgow Gobbler (as he was known) had a heck of a career and did have plenty of accolades to his name. Yet, you have to wonder if his mental game was something that was not only a help, but a hindrance as well-- which could be a reason he was sent back to Portland that final time. Either way, it took him a while to get out in the hockey world, but his short time impacted the landscape-- not only for the Rangers, but also in Oregon; where he was named to the Oregon Sports Hall of Fame in 1987. It took almost 40 years, but the Bruins get to drink for Lord Stanley's chalise once again. A team that played with a lot of heart, a lot of grit, and had their fair share of controversial moments got the ultimate prize in hockey and will now get a chance to revel in the moment. You could say the Bruins wouldn't be this far with Tim Thomas, who won the Conn Smythe Trophy for Playoff MVP and bounced back from hip surgery last season and was able to regain his #1 spot over Tuukka Rask. Thomas went through a lot in his career and it was definitely a great story for him to win the Cup. Considering he and Rask will be together once again next season, the Bruins should be in good shape in next for their defense of the title. The forwards, who really had a committee scoring system this year-- are mostly all back for next season; with Brad Marchand as a RFA and Michael Ryder being the only UFA with Mark Recchi retiring. The question will probably be if there will be any movement from the forwards to get Marchand under contract, especially with the possibility of Marc Savard coming back. However, if Savard or even Nathan Horton have some relapses, that could give the Bruins a bit of breathing room when it comes to their salary cap situation. There shouldn't be any adjustment needed in terms of welcoming new guys into their system; which could be good or bad. The same circumstance is happening with the defense, as the same guys are back for the Bruins, with only Tomas Kaberle and Shane Hnidy not having a contract, and odds are they may not be brought back either. My thought is that as long as the Bruins have Zdeno Chara back there, the rest are just filler. That said, Johnny Boychuk and Adam McQuaid played solidly on the blue line, while Andrew Ference added more veteran presence back there along with Chara. Whether or not this solidifies Claude Julien being behind the bench for a while, he did show that he didn't let the rumors of his possible demise rattle him too much and was able to deal with some serious injuries and really bring home a winner to the Boston fateful-- the city who has won all four major sports titles in North America in a seven year span. They looked like they were destined for their first Cup in franchise history, but a bad bounce here and there; as well as some bad performances on the road were the downfall of the Canucks. Especially with a load of defensemen and some grinders needing contracts, it could be busy for GM Mike Gillis this summer, especially after dealing with a loss. First, let's look at goaltending. I don't care what anyone says, but Roberto Luongo is a world-class goalie. He's got a Gold Medal in the Olympic and in the World Championships. Sure, he was shaky and sure he has 11 years left on his contract.....but he's a goalie who can win in big situations. I don't know what the hell happened in the Finals, but he played great at home up until Game Seven and he may need to work on the mental side of his game to be the best. Luongo is there for a while, but the big question is if Cory Schneider will get more time in net next year or will be dealt in the off-season so he could get a chance with another organization; but after next season-- odds are he won't want to be in Vancouver, knowing he'd be second fiddle to Luongo. The defense could be the big issue, as Kevin Bieksa, Christian Ehrhoff, and Sami Salo are the big names on the blue line that are free agents. While Salo's injuries will probably take his stock down, I wouldn't be surprised to see the other two back in the fold, especially with the offensive prowess they possess. The bad part is that Keith Ballard is still under contract for the next four seasons, which will probably be buried or tried to be moved considering how much faith the team lost in him this playoffs. 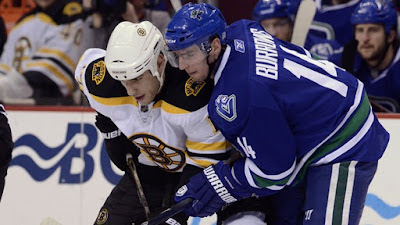 The core was sturdy this season and Gillis will probably do what he can in order to keep them together. Up-front, the core of the Sedins and Kesler are going to be back, but the questions will be if the Sedins they can show up in the playoffs, which they had trouble doing this playoffs. Kesler was a guy who gave his heart in the playoffs, even if he wasn't scoring he was bring energy. When it comes to who to re-sign; two RFAs in Maxim Lapierre and Jannik Hansen will probably be retained; but the future of the UFAs like Raffi Torres and Chris Higgins will probably be up in the air. Torres probably not, if only because there's plenty of agitators on the team as it is and they don't need another, while Higgins could get retained if only for the point that he'll be affordable and can adapt to situations regardless of what they are. The forward lines can be a mix-n-match and still be solid like clockwork because of the top-six being solidified. It'll be a long off-season for the Presidents Trophy holders, but they won't have too many wholesale changes-- which bodes well for the team next season, as they aren't losing out on too much of the players and will probably have the motivation going into next year and actually want to finish it off rather than have all off-season to think what could have been. And as a comment on the rioting-- I'll say this: the city doesn't deserve the idiocy of the meat-heads who don't follow the team as closely as others and didn't get their frustration out with the UFC last weekend. I feel bad for the true fans who get grouped into this and hope the idiots who did this get brought to justice and the city can recover. Win Game Six, Win in Seven?? The old adage in some sports is that if you don't win Game Six, odds are you won't win Game Seven. In some cases that is true and many teams do try to close it out in Game Sixes. Yet, since the seven-game series format has come to the NHL in the 1939 Stanley Cup finals, that hasn't always been the case. It should be noted that I hate research and often have issues with it-- so when you get the misinformation in this and want to correct it, the comments section is the place to do it. If anything else, I'll chalk it up to tiredness and not wanting to be thorough. Since that, there has been 15 series' that have gone the full seven games and in seven of those series have the team that has won Game Six went onto win the Series: 1942 Toronto Maple Leafs, 1950 Detroit Red Wings, 1964 Toronto Maple Leafs, 1971 Montreal Canadiens, 2001 Colorado Avalanche, 2004 Tampa Bay Lightning, and 2009 Pittsburgh Penguins. 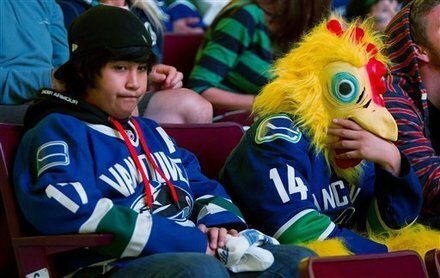 Of the eight teams that didn't win a Game Seven after a Game Six win, only the 1994 Canucks scored more than a goal in their Game Seven loss. The rest of the teams got shutout or only put up one goal in the final game. So, with about 47% winning a Game Seven after winning a Game Six, then only 20% of teams winning a Game Seven on the Road; the odds are slightly in favor of the Canucks and could prove that home-ice advantage is nothing to laugh at, especially with the home team winning the six previous games in this series and in 41 of the previous 82 playoff games this year, excluding the Finals games. 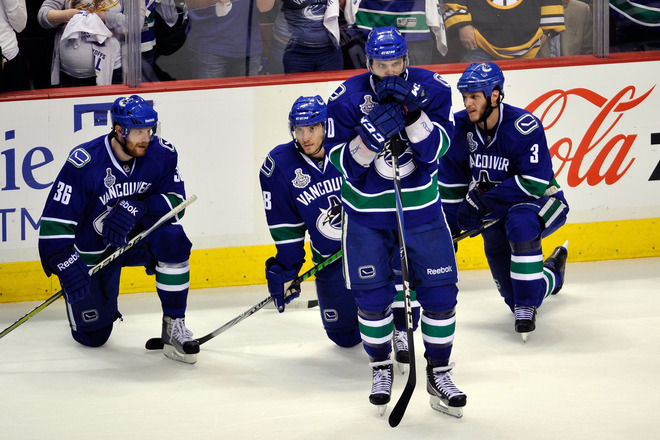 Good news for the Canucks though-- only the 1945 Toronto Maple Leafs, 1971 Montreal Canadiens, and 2009 Pittsburgh Penguins have won Game Seven on the road. While many say hockey is a game of fate, there's some who believe that it's actually a game of faith. A bad opening, sure, but I'm never good at these things. This week's AGM found that he had a higher calling for him after his time in the sun on the rink was over. This week, the profile of Scott Bailey. Bailey started off his career in midget AAA playing for the Calgary AAA Flames for the 1988-89 season, while also playing in two games for the WHL's Moose Jaw Warriors, going 0-1-0 in those games. Bailey play in the Alberta Junior League in the 1989-90 season for 17 games before moving to the WHL full-time for the 1990-91 season with the Spokane Chiefs. In that season, Bailey went 33-11-0 in 46 games, with four shutouts. However, that season, former AGM Trevor Kidd was acquired, relegating Bailey to the bench for the playoffs (in which the Chiefs won the WHL) and only getting into one game (a win) in the Memorial Cup finals-- which the Chiefs also won. Bailey was named Rookie of the Year in the WHL and named to the Second-Team All-Star roster. Bailey would be the starter for the Chiefs in the 1991-92 season, posting a 34-23-5 record in 65 games, then going 5-5 in the playoffs. It would be the second straight season Bailey would have Second-Team All-Star honors. During the Draft, Bailey was selected in the 5th Round by the Boston Bruins. The 1992-93 season saw Bailey in the ECHL with the Johnstown Chiefs, playing in 36 games and finishing with a 13-15-3 record. Bailey would spend the majority of the 1993-94 season in the ECHL, but this time with the Charlotte Checkers, going 22-11-3 in 36 games, while also going 1-2 in three playoff games. Bailey would also get promoted to the AHL's Providence Bruins that season, going 2-2-2 in seven appearances. Providence would be Bailey's home for the 1994-95 season, with a 25-16-9 record with the P-Bruins, while going 4-4 in the playoffs. 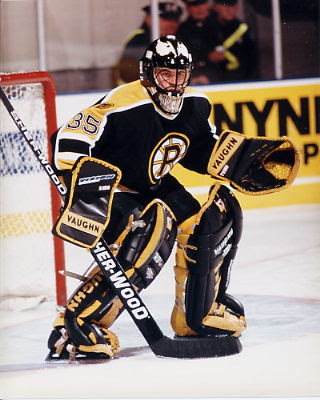 The 1995-96 season had Bailey spend the majority of it with Providence, going 15-19-3 in 37 games, but in the middle of the season; Bailey got a call to the Boston Bruins, where he would play in 11 games and put up a 5-1-2 record. That record and a solid training camp allowed Bailey to be with Boston from the start of the 1996-97 season, however-- he would go 1-5-0 in eight games, which would see him be sent to Providence. With the P-Bruins, he would go 11-17-2 in 31 games, then 3-4 in seven playoff games. Bailey moved to the IHL and the San Antonio Dragons for the 1997-98 season; where he would put up an 11-17-3 record in 37 contests. Bailey would be back in the IHL for the 1998-99 season, playing in 17 games with the Orlando Solar Bears, putting up a 5-7-0 record before moving to the ECHL's Birmingham Bulls for 27 games and finishing with a 16-8-2 record, then going 2-3 in five playoff games. The start of the 1999-2000 season had Bailey play in Finland for a six game stint, going 0-4-2 with Tappara Tampere; but would be signed by the Charlotte Checkers of the ECHL in December of 1999, where he would play 31 games and post a 10-16-4 record. The Checkers would loan out Bailey to the AHL's Saint John Flames for four games, where he would go 0-1-0. Bailey stayed with the Checkers in the 2000-01 season, splitting time with Jason Labarbera-- playing in 29 games and putting together a 10-12-5 record, then going 1-2 in three playoff games. Bailey went to the extremes in the 2001-02 season, first playing a game with the London Knights in the British League, before going half-way across the globe to sign on with the Anchorage Aces of the Western Coast League for 10 games, going 1-7-1 in those games before he would hang-up the pads. Post-hockey, Bailey worked on his college life, attending Taylor University College in Edmonton where he would earn a degree in Religion and Theology, while minoring in Biblical Languages (Greek and Hebrew). Right now, Bailey is working on his Masters in Bibical Studies at Trinity Western University in British Columbia; as well as blogging about a variety of things at Scotteriology. As a late-bloomer, Bailey was able to mature faster into the professional game, but it seemed that one thing or another stopped his sticking power in the organization he was in; resulting in bouncing all around the globe. But, as he tells it, he's blessed to have had the chance to do what he's done. According to Pierre LeBrun of ESPN, there won't be a Heritage Classic for the 2011-12 season. Of course, the Heritage is the Canadian version of the Winter Classic; but in the grand scheme-- it's not the worst idea out there. Last year, there was numerous amounts of outdoor games, which some take in stride-- but to someone like me, it seemed like a bit of overkill. I enjoy the gimmick of the outdoor hockey game and having been to one-- it's like nothing I've ever experienced. But at the same time, you have a limited amount of places to hold it; and the places you do hold it at sometimes don't have the best conditions-- even in winter. 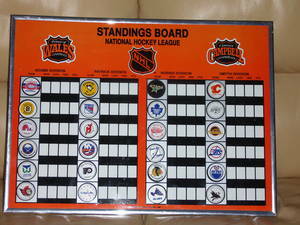 Then you move to the Heritage Classic, which usually has two Canadian teams in it. There's only seven teams in Canada. Your pool is increasingly more shallow, and while you'll have the turnout all the time....seeing the same place over and over again for an outdoor game could lose it's luster. It's the same reason people hate seeing the same teams in the event every year, despite them making the ratings on TV jump. It's not an entirely bad thing because you won't saturate the ideal of the game, while also increasing the hype and the push for the Heritage Classic to come back to the Canadian market. It was eight years from one Heritage Classic to another, so they can sustain the love for the outdoor game regardless of the time frame. 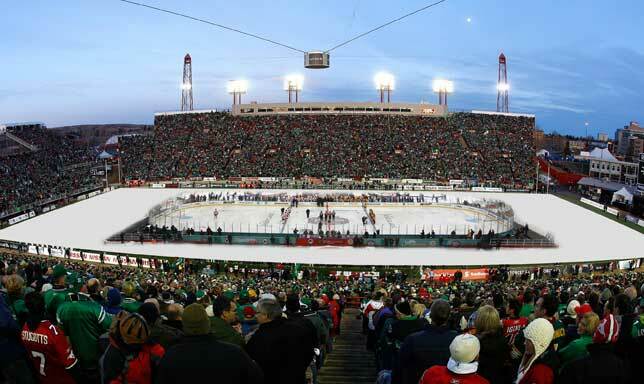 It's instilled in the nature and really puts more of the spotlight on the Winter Classic, as it would be the only chance for the NHL to take it outdoors. 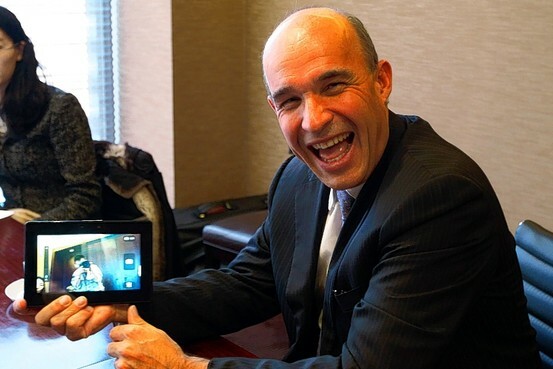 Is That Jim Balsillie's Music?!? While the Winnipeg situation has been going on, we have had people question about what happened to Jim Balsillie in all of this. Well, welcome back Jimbo, as Gary Bettman has publicly said that he Balsillie could get sold a team.....if he doesn't mess things up. Oddly enough, this coincides with the fact many Blackberry advertisements showing up during the NHL Playoffs and during the Stanley Cup Finals; both on TV and online with the NHL. Now, Balsillie has already effed up his chances three times-- Pittsburgh, Nashville, and Phoenix have all been within Balsillie's grasp; but due to his overzealous nature-- he has lost out on those teams. 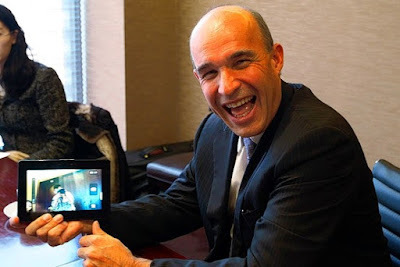 We all know that Balsillie is a guy who wants to have a team and probably wants them in Canada, as he lives there. The biggest question is whether or not he can actually get a team into a place he wants it to be. Hamilton has been the destination for him for every team he's had an eye on. The biggest hurdle there is the Toronto Maple Leafs not wanting someone to infringe on their turf. So, if Hamilton isn't in the cards, is that going to be a problem with Balsillie?? While he wants to be an owner, he probably wouldn't want to be an owner if he can't get his team into his home country. I doubt he'd want to go to Quebec City, if they get their new rink build-- but if it's the only option; what do you do-- head to a place you don't want to put a team in or not have a team at all?? Yet, the biggest hurdle for Balsillie is really himself. While he's had three attempts, many people believe he'd be a good fit as a NHL owner and if he was able to contain his excitement; he'd actually be an owner by now. Odds are that even if he's sold a team, the amount of people on Board of Governors that he has rubbed the wrong way would probably be problematic for his search to be welcomed into the society of the NHL ownership brotherhood. But first, he has to get a team; which may or may not be difficult to do depending on which team comes knocking at death's door next. The odds are definitely against Balsillie, as you can imagine he's probably the last resort for the NHL when it comes to getting rid of a team; but with the amount of teams seemingly going belly-up, he may have to be put in there quick due to the lack of suitors out there. He should be great for any team, despite the threat of relocating to Canada and will pump money into a team in order to make it a winner. Plus, the fact he's a rebel before owning a team will definitely make things interesting just to see what he'll do next; which could be good for the game in the end of it all. There's a lot to say about hype and getting caught into it. We all know that most of these AGMs get caught in their own hype; but this week's AGM was caught into someone else's hype, which may have stalled his own career a bit. Sure, he bounced back for a bit-- but in the end it never was the same. This week, we look at the career of Marco Baron. Baron started out his career in the QMJHL, playing in 64 games with the Montreal Juniors in 1975-76 and 1976-77 before moving onto the Verdun Eperviers where he'd appear in 128 games in the 1977-78 and 1978-79 season. With Verdun, Baron garnered Second Team All-Star honors in 1978, as well as leading the QMJHL in shutouts, with three, in 1978-79. However, thanks to the lack of record keeping, no records are available for Baron. After his junior career, Baron took to the pros-- being selected 99th overall by the Boston Bruins in the 1979 Draft. 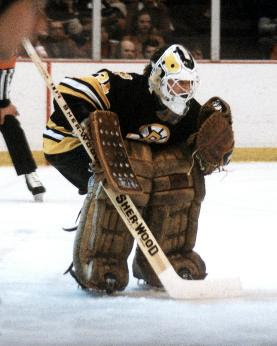 Baron started and spent the majority of the 1979-80 season with the Grand Rapids Owls of the IHL, where he would play in 35 games before getting called up to play for the Binghamton Dusters. With the Dusters, Baron would go 0-5-0 in six games, while getting one game in Boston that season, which was a no-decision. The 1980-81 season was a tough one for Baron, who was bumped as a back-up to Rogie Vachon by US Olympic hero Jim Craig, relegating Baron to the AHL's Springfield Indians, playing in 23 games with a 12-11-0 record. Baron would get a call-up to Boston that season for 10 games, going 3-4-1 in those games and then 0-1 in his only playoff appearance that year. While Baron would start the 1981-82 season with the Erie Blades (1-1-0 in two games), the bulk of the time would be spent with the Bruins and would get a majority of the games, going 22-16-4 record in 44 games. However, it wouldn't last for Baron, who would spend most of the 1982-83 season with the Baltimore Skipjacks of the AHL, going 8-11-1 in 22 games before being called up to the Bruins for nine games and sporting a 6-3-0 record. The 1983-84 season had Baron staying in the AHL with the Moncton Alpines going 6-7-3 in 16 games before being put on the move. In January of 1984, Baron was dealt by the Bruins to the Los Angeles Kings for Bob LaForest. With the Kings that season, Baron would go 3-14-4 in 21 games on a very sub-par Kings team. Baron would have a shaky 1984-85 season, playing in one game with the Sherbrooke Canadiens of the AHL for one game (no decision) before getting signed with the Edmonton Oilers. Baron would play one game with the Oilers (a loss), then would be sent down to the Nova Scotia Oilers. With Nova Scotia, Baron would play 17 games finishing with an 8-7-1 record. Also that season, the Canadiens won the Calder Cup and Oilers won the Stanley Cup; but Baron did not qualify to receive any accolades for that. After that season, Baron would move overseas to Switzerland to play for Ambri-Piotta for seven games in the 1985-86 season before hanging up the pads for good. After his playing career, Baron stayed in Switzerland and with Ambri-Piotta as an assistant coach with the main squad and head coach for the youth and junior team squads. While he was almost derailed by an upstart goalie, he was able to rebound nicely; though he snapped right back to the downside. He kept plugging away at it and seemed to be stuck in bad situations where he wasn't able to shine as bright as he did early on in his career. Luckily, he was able to stay into hockey after his playing career and grow the game into a developing hockey nation. With the Winnipeg market pretty much assured a team (if the Board of Governors eff this up, oh boy will there be riots); the move now is what's going to happen with the Divisional alignments after the 2011-12 season. While I've touched on this recently, the more I think about it.....the more idiotic it gets. More over, you take out Detroit from the West to the East, Western average is 1,277 and East is 1,550. With Columbus; 1,251 in the West and 1,574 in the East. Then while doing the Face Off Hockey Show in the past weeks, I think JonnyP, Marc "With a 'C'", and myself came to realize.....the divisions don't really matter anymore. With the playoff alignment being as they are, you don't have to really play out of your division like you had to two decades ago. All the divisions mean is that you have at least on representative in the playoffs and you play those teams more often. It's not like in the '90s when you had to actually play out of your division to get to the Conference Finals; therefore making the divisional rivalries actually mean something. To that wit, I think it doesn't matter where you put Winnipeg now. Especially with Gary Bettman saying the scheduling will be more balanced after the 2011-12 season, the ideal of divisions really don't hold the same brunt as they once did. You're still going to have to travel around North America and the distances will be extreme for some teams over others. You're still going to have the top-8 in the Conference make the playoffs, or top-7 and a divisional leader that is well behind and gets a courtesy spot. Unless the NHL can find a way to get all the teams into four divisions (two in each conference), the idea of divisions are only for a top-3 spot in the conference standings. Personally-- you should just take out the divisional aspect of it all and actually have the best eight teams in each conference duke it out to represent for the East and West. If you can't play out of your division and have to be crowned divisional champion because of regular season triumphs-- why even have them at all?? Alright....well....I guess it's time for me to give a prediction, huh?? Well, interesting. First and foremost, this is a match-up against two of the best goalies in the league and two of the best tandems in net in the league. That will probably what will make or break the Finals....or not. But, the interesting ideal that either Tim Thomas or Roberto Luongo could fall apart of the opponent figure them out is a great side story to look at. If you want statistical breakdowns.....go elsewhere for actual fact. From what I've seen, the Bruins forwards have been better defensively and in the plus/minus column-- which, sure, is a misnomer in some instances; but very interesting that six out of the top-10 in plus/minus are Bruins and only one is a Canuck, which is Kevin Bieksa. Don't know how well that'll play into things, but still. The special teams battle is where this should be won or lost. Boston's power-play is working at 8%, while the Canucks are at 28%; though the PKs are about the same (Canucks 80.6%, Bruins 79.4%), the power play could be the downfall of the Bruins. That said, if the Bruins play undisciplined, the Canucks will make them pay, especially after the Sedins were woken up last series. The Bruins are taking about 11 PIMs a game, which is more than enough time for the Sedins to connect. It'll come down to depth, and with these teams matching up very nicely-- it'll be a battle through it all. David Krejci and Nathan Horton will have to continue to be lights out for the Bruins, with Brad Marchand trying to stir the pot and maybe spark that power play or irk Roberto Luongo. The Canucks have the Sedins and Ryan Kesler, but Alexandre Burrows has been solid for the Canucks in these playoffs and could be a difference maker in this series. I think the Vancouver Canucks will lift the Cup for Canada for the first time since 1993. They are on a mission, they have been more focused this season and post-season than ever before and they'll probably do well enough against the Bruins to force them to make mistakes and get Thomas off his game enough to capitalize on his gaffs.